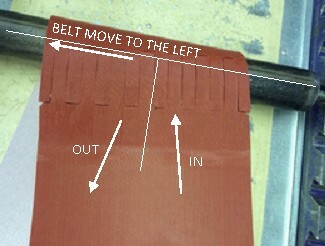 If the belt moves a bit from the left to the right of center, it is clearly a problem with the alignment or leveling. This can be easily fixed. The joint of the belt must be as straight as possible. Belts are currently cut on a table that ensures a straight cut. A drive roller that is no parallel with the conveyor will be difficult to track. Furthermore if a drive roller is no parallel with a tension roller it may cause problems with tracking. Define if your belt is tighter or slack. Basically no slippage between the belt and the pulley will be appearing. Also, the belt should be adapted to the crown of sprocket. Any more tension must be prevented because it could rupture the belt seam. Remove the right bearing to the exterior to make the head roller advance in a position that will tighten the belt. Put the left one in to move the head roller in a position that will slacken the belt. Make an adjustment, and then look at the belt. Make a new adjustment and examine again. Small adaptations are requiring checking if you do not overly loosen or tighten the belt because it may cause problems. 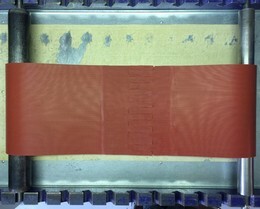 Reiterate the process till the belt looks centered to you. Clean the belt. Any foreign things can alter the tracking. Verify that the snub rollers, carry idlers, return idlers and pulleys are all parallel to each other. Every non parallel roller can modify the belt tracking. Be sure they are perpendicular too to the belt center line and square with the frame. If the belt excel these tests, it basically be centered, but a final test can confirm this. Launch the conveyor belt in the reverse run, to the tail pulley. The belt must be empty. Check it during three entire revolutions. Put an entire-load on the belt and move it in reverse direction for three more belt revolutions. The machine track differently when load is added. Check the conveyor move in the current direction with the same load for three final revolutions. Remove an idler if the belt is over adjusted. You can do that as the belt is moving. Slimmer belt will track better than a thick one because the belt will better fit into pulley’s crown. A loss of lagging material off a drive pulley will cause a belt to swing on the track. It can move from the right to the left. If you find that you have to adjust a roller in the opposite way as described before, so if you tighten on the right side and the belt moves to the right, it is a sign that your belt is thicker than what you need compare of pulley diameter. 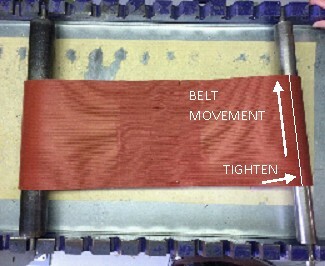 A thicker belt will swing on the center of a crown. In this case, the current law may change: the belt will be conducted by roller orientation, leave the head and end rollers in a perpendicular way (See figures D & E). If a belt is longer as wide it will be hard to track it. So, more square belts are, harder it will be to get it to move to one side or the other. In this case, you must use a belt as thin as possible. Build up on a drive or tensioning pulley will naturally act on tracking. This may cause some tensions and there for a wandering belt. A floating belt can cause drifting. If the belt runs straight without anything on it, you must tighten the belt before put a load on it. 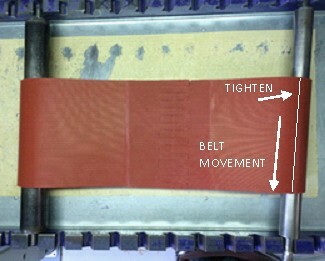 A heavy weight coming onto a belt at an angle acts just like a person which is pushing on the belt. 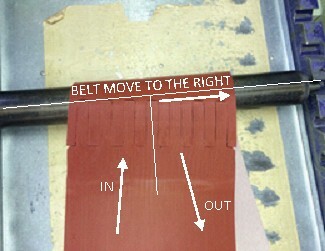 The load must go onto the belt as straighter and centered as possible. As say above don't put anything that can tear the belt’s seam. It is better to go slower and easier when pushing the belt to the right direction.